As we place our pumpkins out at the curb and start digging out the old holiday decoration bins, homeowners near and far will begin to deck the halls. Even though our turkeys have yet to hit the table yet, we think it’s fair to start gearing up for your holiday décor now. In this two-part blog, we’ll give you some of the best tips out there to make sure that you make the most of this festive tim e of year. We’re going to work from the outside in and go through the best tips for the outside of your home. There’s something about driving up to your house during the holiday season and seeing those twinkly lights flicker and that holiday wreath shine. So let’s dig in. We’re going to start it off with some safety reminders here. The National Fire Protection Association (NFPA) statistics indicate that 30% of all home fires and 38% of home fire deaths occur during the months of December, January, and February. On top of that, about 5,800 individuals are treated annually in hospital emergency rooms for injuries sustained from falls involving holiday decorations. Nothing spoils the holiday season more than seeing your electric bill skyrocket. 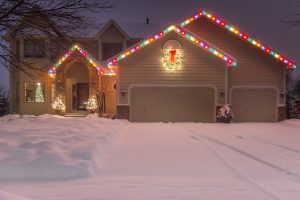 Luckily, there are plenty of ways to light up your house this season without breaking the bank. A lot of people tend to simply string some lights, hang a wreath, and call it a day. There are so many fun and easy ways you can add some extra cheer to your house this year. Have a window sill to fill? Try adding some of those oversized ornaments on there as well! Keeping with the trend, there are plenty of beautiful and simple outdoor decorations you can use to give your home that warm, rustic feel. You don’t always need to have a blowup army of holiday characters on your front lawn to get in the holiday spirit, after all. Green garland and natural wreaths can give a simple and elegant holiday feel to your home. This can be especially helpful for those homeowners who also have a “For Sale” sign out on their lawn this season. Green garland may be boring to some, but it is truly a classic touch that will make any house feel like a home. Christmas wreaths can have a lot more than a bow and some holly. While we love the classic look, this is an excellent opportunity for you to add some unique character to your home without going overboard. Stay tuned for our next piece on holiday tips for inside the house!